Is the Current Communion Fast Really Enough? This precept states that 40 days after giving birth, a woman “shall bring to the door of the tabernacle of the testimony, a lamb of a year old for a holocaust, and a young pigeon or a turtle for sin, and shall deliver them to the priest, who shall offer them before the Lord.” For this reason, the Purification serves as the formal end of the Christmas season, being celebrated exactly forty days after it. The liturgy also formally marks the Purification as the end of the whole cycle of celebrations that form the first part of the Church’s year. On the first Sunday of Advent, the Postcommunion begins with the words, “May we receive (suscipiamus) Thy mercy, Lord, in the midst of Thy temple”, while the Introit of the Purification, citing Psalm 47 more exactly, begins with the verb in the indicative: “We have received (suscepimus), o God, Thy mercy, in the midst of Thy temple.” This change indicates that what we asked for and awaited in Advent has been fully received in the Birth of Christ. It should also be noted that the earliest possible date for Ash Wednesday is February 4th. (This has not occurred since 1818, and will not occur again until 2285.) The Christmas cycle, including the preparatory season of Advent, will therefore always be separated from the Easter cycle, including the preparatory season of Lent, by an interval of at least one day. 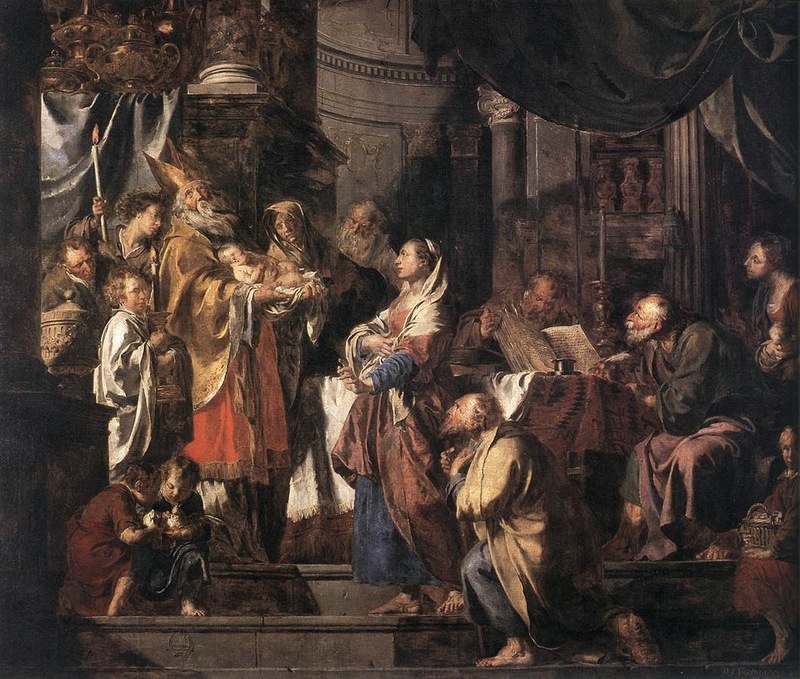 In the later 4th century, the pilgrim Egeria wrote, in her famous account of her visit to the Holy Land, that the Meeting of the Lord with Simeon in the Temple was celebrated there with particular solemnity, “just as at Easter”, forty days after Epiphany. 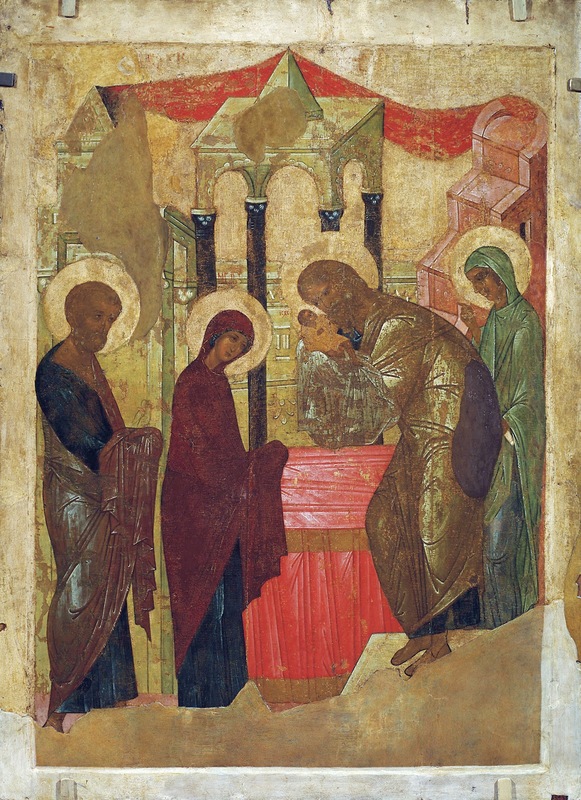 In her time, the Epiphany commemorated all the events of the Lord’s birth, and the Meeting was therefore originally kept on February 14th; this arrangement is still observed to this day in the Armenian Rite. When the feast of Christmas was adopted in the East shortly after (and in some places, even before), the eastern Epiphany was made to focus on the Lord’s Baptism; the Meeting, as an event of His infancy, was then moved back to February 2nd, counting the forty days from December 25th. The traditional Roman Mass of the Purification refers to the Virgin only where She is mentioned in the Gospel, and almost parenthetically in the Postcommunion. Likewise, the rites that precede the Mass refer to Her once in the first prayer for the blessing of candles, (again, almost parenthetically), and twice in the processional antiphons. The double character of the feast noted by Sicard and Durandus is more clearly expressed in the Office, many parts of which are taken from the common for feasts of the Virgin. However, even here, the invitatory, lessons and responsories of Matins, and the Lauds antiphons, (also used at the following Hours), all refer to the Meeting of Christ with Simeon. 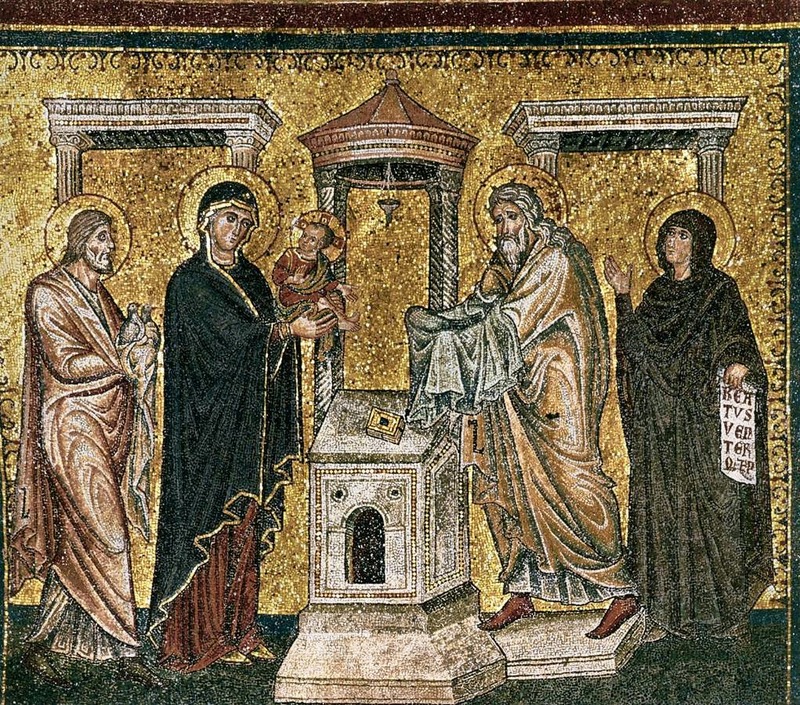 According to the Liber Pontificalis, Pope St Sergius I (687-701) established a procession from the church of St Adrian in the Roman Forum to Saint Mary Major, to be held on the Annunciation, the Dormition and Nativity of the Virgin, and the “feast of St Simeon”. Born in Sicily, but of Syrian origin, this Pope was certainly familiar from his youth with the liturgies of both the Byzantine and Latin tradition. There is good evidence that a procession with candles was associated with the feast from an early date, as Butler’s Lives also notes, but it died out entirely in the East; where it is done today in a few Eastern churches, it is a fairly recent Latinization. There is no mention of candles in the Liber Pontificalis’ words about Pope Sergius, nor in the early Roman liturgical books; the first reference to a blessing of candles on February 2nd is found in the late 10th century. 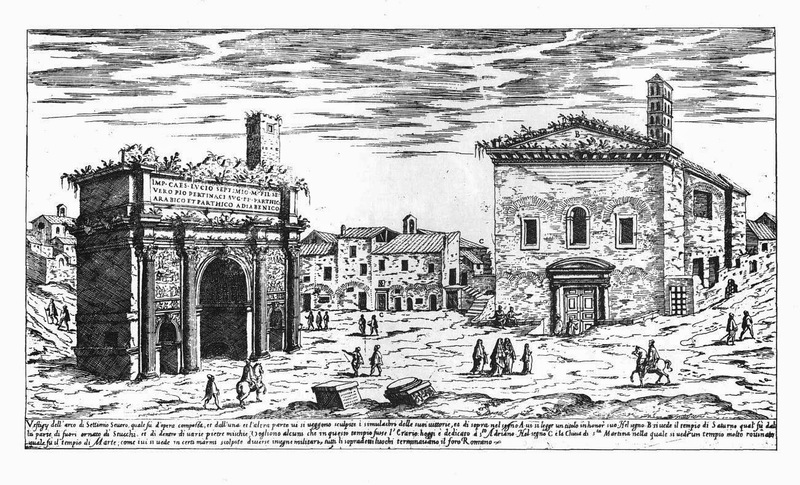 The church of Saint Adrian in the Roman Forum, shown here on the right in a 16th century print. The church was built in the 7th century inside the long-abandoned Roman senate house known as the Curia Julia, but almost every trace of the building’s history as a church was removed in a restoration from 1935-38. The Roman blessing is characteristically simple, following a pattern similar to that of the blessing of palms. Five prayers are said over the candles, after which they are sprinkled with holy water and incensed, and then distributed, as the canticle of Simeon Nunc dimittis is sung with the antiphon after every verse, “A light to the revelation of the gentiles, and the glory of thy people Israel.” After a second antiphon and a brief collect comes a procession, accompanied by the singing of two long antiphons. The first of these is borrowed from the Byzantine Liturgy; the second is from the day’s Gospel. Aña Adorn thy bridal chamber, o Sion, and receive Christ the King. Embrace Mary, who is the gate of heaven, for she bears the glorious King of the new light. She remains a virgin, as she brings forth in Her hands the Son, begotten before the day-star; whom Simeon taking into his arms, proclaimed to peoples to be is the Lord of life and death and the Savior of the world. Aña Simeon had received an answer from the Holy Ghost, that he would not see death, before he had seen the Anointed of the Lord; and when they were bringing the Child into the temple, he received Him in his arms, and blessed God, saying, “Now dost thou dismiss thy servant, O Lord, in peace. V. When His parents were bringing Jesus, to do according to the custom of the Law for Him, he took Him in his arms. As the procession enters the church, one of the responsories of Matins is sung; note the clever way the repetition of the verse completes the doxology at the end. R. They offered for Him unto the Lord a pair of turtle-doves, or two young pigeons * As it is written in the law of the Lord. V. And after the days of Mary’s purification were fulfilled, according to the law of Moses, they brought Him to Jerusalem, to present Him to the Lord. As it is written. Glory be. As it is written. The historical Roman tradition was to use violet vestments for the procession, and white for the Mass which follows on returning to the church. Lit candles are held by the clergy and faithful (as much as may be practically allowed) during the procession, at the singing of the Gospel, and from the Canon to communion. The Lupercalia are mentioned repeatedly by other Church Fathers, and even at the end of the fifth century, Pope St Gelasius I felt the need to combat some vestiges of its celebration. A race though the city that formed part of the festival was still being run, and the Pope sarcastically suggests in a letter to a Roman senator who defended the practice that the runners should return to the more ancient practice, and go naked. Bede’s idea becomes more tempting as an explanation for the procession’s origins when one considers that the Lupercalia were celebrated from February 13th to the 15th, coinciding with the Purification’s original Eastern date; and further, that the name of the Christian feast that begins the ancient Roman month of purification was changed to “the Purification” in Rome. For all this, however, it is extremely unlikely that any vestiges of the pagan rite remained in the time of Pope Sergius, who instituted the procession almost two centuries after Gelasius, and not for the Purification alone, but for all the Marian feasts. Rome had suffered in the meantime a significant depopulation during the plagues and wars of the sixth century, which dealt a massive blow to the city’s ancient customs and institutions. Furthermore, there is no reason to believe that the feast was ever kept in the West on any date other than February 2nd.